Adjutant General J F Hoke, North Carolina, was appointed colonel, 13th North Carolina Infantry, at Garysburg, Northampton County, North Carolina, on 10 July, 1861. 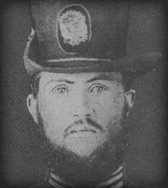 J W Leak was appointed lieutenant colonel, 13th North Carolina Infantry, at Garysburg, Northampton County, North Carolina, on 22 July, dated 10 July, 1861. D H Christie was appointed major, 13th North Carolina Infantry, at Garysburg, Northampton County, North Carolina, on 10 July, 1861. The company was accepted or mustered in state service for one year at Anson County, North Carolina, on 22 May, 1861, and was mustered in Confederate service for one year at Weldon, Halifax County, North Carolina, by Captain & Assistant Quatermaster W J Clark, Confederate States Army, on 15 July, 1861, dated 13 July, 1861. Captain W F Harlee, 23rd North Carolina State Troops, resigned on 15 December, 1861. The company was accepted or mustered in state service for one year at Hog Hill, Lincoln County, North Carolina, on 23 May, 1861, and was mustered in Confederate service for one year at Weldon, Halifax County, North Carolina, by Captain & Assistant Quatermaster W J Clark, Confederate States Army, on 15 July, 1861, dated 13 July, 1861. The company was accepted or mustered in state service for one year at Mountgomery County, North Carolina, on 27 May, 1861, and was mustered in Confederate service for one year at Weldon, Halifax County, North Carolina, by Captain & Assistant Quatermaster W J Clark, Confederate States Army, on 15 July, 1861, dated 13 July, 1861. The company was stationed at the Camp of Instruction, on the Seaboard & Ranoke Railroad, one mile southwest of Garysburg, Northampton County, North Carolina, on 17 July, 1861, and arrived at Camp Wigfall, J J Wilcoxen's Farm, in the vicinity of the intersection of Union Mills and Hooe's Hill Roads, Prince William County, Virginia, on 8 August, 1861. The company was accepted or mustered in state service at Richmond County, North Carolina, on 31 May, 1861, and was mustered in Confederate service for one year at Weldon, Halifax County, North Carolina, by Captain & Assistant Quatermaster W J Clark, Confederate States Army, on 15 July, dated 13 July, 1861. The company was stationed at the Camp of Instruction, on the Seaboard & Ranoke Railroad, one mile southwest of Garysburg, Northampton County, North Carolina, on 17 July, 1861, and arrived at Camp Wigfall, J J Wilcoxen's Farm, in the vicinity of the intersection of Union Mills and Hooe's Hill Roads, Prince William County, Virginia, on 8 August, 1861. The company was accepted or mustered in state service at Oxford, Granville County, North Carolina, on 5 June, 1861, and was mustered in Confederate service for one year at Weldon, Halifax County, North Carolina, by Captain & Assistant Quatermaster W J Clark, Confederate States Army, on 15 July, dated 13 July, 1861. The company was accepted or mustered in state service at Newton, Catawba County, North Carolina, on 6 June, 1861, and was mustered in Confederate service for one year at Weldon, Halifax County, North Carolina, by Captain & Assistant Quatermaster W J Clark, Confederate States Army, on 15 July, dated 13 July, 1861. The company was accepted or mustered in state service at Granville County, North Carolina, on 11 June, 1861, was mustered in Confederate service for one year at Weldon, Halifax County, North Carolina, by Captain & Assistant Quatermaster W J Clark, Confederate States Army, on 15 July, dated 13 July, 1861. The company was accepted or mustered in state service at Gaston County, North Carolina, on 12 June, 1861, and was mustered in Confederate service for one year at Weldon, Halifax County, North Carolina, by Captain & Assistant Quatermaster W J Clark, Confederate States Army, on 15 July, dated 13 July, 1861. The company was stationed at the Camp of Instruction, on the Seaboard & Ranoke Railroad, one mile southwest of Garysburg, Northampton County, North Carolina, on 17 July, 1861, and arrived at Camp Wigfall, J J Wilcoxen's Farm, in the vicinity of the intersection of Union Mills and Hooe's Hill Roads, Prince William County, Virginia, on 8 August, 1861. The company was accepted or mustered in state service at Oak Hill, Granville County, North Carolina, on 17 June, 1861, and was mustered in Confederate service for one year at Weldon, Halifax County, North Carolina, by Captain & Assistant Quatermaster W J Clark, Confederate States Army, on15 July, dated 13 July, 1861. The company was accepted or mustered in state service at Lincoln County, North Carolina, on 22 June, 1861, and was mustered in Confederate service for one year at Weldon, Halifax County, North Carolina, by Captain & Assistant Quatermaster W J Clark, Confederate States Army, on 15 July, dated 13 July, 1861. "Among the arrivals here yesterday were Reuben Ragland, Petersburg; R. E. Dixon, A. R. Lamar, Ga. Graham Daves, N. C.; R. J. Capron, J. Wilson Hodges, Baltimore; Geo. Tyler, Caroline; Judge Walter Brooke, Vicksburg, Miss. ; also a detachment of 13th N. C. State troops, Col. J. F. Hoke; several companies of South Carolina troops, and several hundred Texans, with long rifles." "the Thirteenth Regiment N. C. Volunteers, Col. J. F. Hoke, late Adjutant General, struck their tents today, and took up their line of march for Virginia. Col. Hoke was elected last Wednesday, and today starts for the battlefield, showing that he intends to lose no time before confronting the enemy, and affording his men an opportunity of giving him another Bethel welcome." "On Wednesday, 17 July, Colonel Hoke, with seven companies of the regiment, left the 'Camp of Instruction' at Garysburg, N C, in freight cars for Richmond, Va. Companies C, D and H, were for the time being necessarily left behind on account of the prevalence of measles among the men." The 13th North Carolina Infantry was organised at Weldon, Halifax County, North Carolina, on 10 July, 1861, and was stationed at Camp of Instruction, on the Seaboard & Ranoke Railroad, one mile southwest of Garysburg, Northampton County, North Carolina, on 17 July, 1861. Note: The 13th North Carolina Infantry, Company H, was ordered to proceed by the Seaboard & Ranoke Railroad to Garysburg, Northampton County, North Carolina, on 19 June, 1861. Mustered for one year, Weldon, Halifax County, North Carolina, 15 July, 1861, dated 13 July, 1861: The 13th North Carolina Infantry mustered in Confederate service for one year at Weldon, Halifax County, North Carolina, by Captain & Assistant Quatermaster W J Clark, Confederate States Army, on 15 July, dated 13 July, 1861. Note: The 13th North Carolina Infantry, Companies C, D, and H, under the command of Major D H Christie, had an outbreak of measles and were detained at the Camp of Instruction, on the Seaboard & Ranoke Railroad, one mile southwest of Garysburg, Northampton County, North Carolina, on 17 July, 1861. Camp of Instruction, on the Seaboard & Ranoke Railroad, one mile southwest of Garysburg, Northampton County, North Carolina, to Richmond, Henrico County, Virginia, Companies A, B, E, F, G, I, & K, 17-18 July, 1861: The 13th North Carolina Infantry, Companies A, B, E, F, G, I, and K, under the command of Colonel J F Hoke, were ordered to proceed by the Wilmington & Weldon Railroad to Richmond, Henrico County, Virginia, on 17 July, 1861, and arrived by the Richmond & Petersburg Railroad via Weldon, Halifax County, North Carolina, and Petersburg, Dinwiddie County, Virginia, on 18 July, 1861. Note: The 13th North Carolina Infantry, Companies A, B, E, F, G, I, and K, were stationed at Rocketts Old Field, two miles southeast of the Capitol, Capitol Hill, Richmond, Henrico County, Virginia, between 18 and 21 July, 1861. Rocketts Old Field, two miles southeast of the Capitol, Capitol Hill, Richmond, to Manassas Junction, Prince William County, Virginia, Companies A, B, E, F, G, I, & K, 21 July, 1861: The 13th North Carolina Infantry, Companies A, B, E, F, G, I, and K, under the command of Colonel J F Hoke, were ordered to proceed by the Virginia Central Railroad to Manassas Junction, Prince William County, Virginia, by Special Orders No.225, Paragraph VII, Headquarters, Virginia Forces, Richmond, Henrico County, Virginia, in the morning on 21 July, 1861, dated 18 July, 1861, and arrived by the Orange & Alexandria Railroad at Camp Pickens, Manassas Junction, Prince William County, Virginia, in the evening the same day. Note: The 13th North Carolina Infantry, Companies A, B, E, F, G, I, and K, were delayed at Rappahannock Station, on the Orange & Alexandria Railroad, Fauquier County, Virginia, on 21 July, 1861. Camp Pickens, Manassas Junction, Prince William County, Virginia, to J J Wilcoxen's Farm, east of the intersection of Union Mills & Hooe's Hill Roads, Prince William County, Virginia, 22 July, 1861: The 13th North Carolina Infantry, Companies A, B, E, F, G, I, and K, arrived at Camp Wigfall, J J Wilcoxen's Farm, east of the intersection of Union Mills and Hooe's Hill Roads, Prince William County, Virginia, on 22 July, 1861. Note: The 13th North Carolina Infantry was assigned to the Sixth Brigade, First Corps, Army of the Potomac, by Special Orders No.169, Paragraph I, Headquarters, First Corps, Army of the Potomac, Camp Pickens, Manassas Junction, Prince William County, Virginia, on 25 July, 1861, and the 11th North Carolina Infantry was assigned to the Seventh Brigade, First Corps, Army of the Potomac, under the command of Brigadier General G B Crittenden, Confederate States Army, at Pageland, two miles northeast of Gainesville, Prince William County, Virginia, on 29 August, 1861. Camp of Instruction, on the Seaboard & Ranoke Railroad, one mile southwest of Garysburg, Northampton County, North Carolina, to Richmond, Henrico County, Virginia, Companies C, D, & H, 5-6 August, 1861: The 13th North Carolina Infantry, Companies C, D, and H, under the command of MajorD H Christie, were ordered to proceed by the Wilmington & Weldon Railroad to Richmond, Henrico County, Virginia, on 5 August, 1861, and arrived by the Richmond & Petersburg Railroad via Weldon, Halifax County, North Carolina, and Petersburg, Dinwiddie County, Virginia, on 6 August, 1861. Richmond, Henrico County, to Manassas Junction, Prince William County, Virginia, Companies C, D, & H, 8 August, 1861: The 13th North Carolina Infantry, Companies C, D, and H, under the command of Captain C J Cochrane, 13th North Carolina Infantry, Company C, were ordered to proceed by the Virginia Central Railroad to Manassas Junction, Prince William County, Virginia, by Special Orders No.245, Paragraph I, Adjutant & Inspector General's Office, Richmond, Henrico County, Virginia, on 8 August, 1861. Camp Wigfall, J J Wilcoxen's Farm, east of the intersection of Union Mills & Hooe's Hill Roads, Prince William County, Virginia, to Wolf Run Shoals Ford, on the Occoquan River, 24 August, 1861, dated 21 August, 1861: The 13th North Carolina Infantry was ordered to Wolf Run Shoals Ford, on the Occoquan River, by Special Orders No.257, Paragraph II, Headquarters, First Corps, Army of the Potomac, Camp Pickens, Manassas Junction, Prince William County, Virginia, on 24 August, 1861, dated 21 August, 1861, and arrived at Camp Ellis, in the vicinity of Wolf Run Shoals Ford, on the Occoquan River, the same day. Camp Ellis, in the vicinity of Wolf Run Shoals Ford, on the Occoquan River, to Fairfax Station, Fairfax County, Virginia, 29 August, 1861: The 13th North Carolina Infantry was ordered to Fairfax Station, Fairfax County, Virginia, by Special Orders No.280, Paragraph I, Headquarters, First Corps, Army of the Potomac, Camp Pickens, Manassas Junction, Prince William County, Virginia, at 2 PM on 29 August, 1861, and was stationed at Fairfax Station, Fairfax County, Virginia, between 29 August and 3 September, 1861. Redesignated 23rd North Carolina State Troops, 14 November, 1861: The 13th North Carolina Infantry was redesignated the 23rd North Carolina Troops on 14 November, 1861. Surrendered at Appomattox Courthouse, Appomattox County, Virginia, 9 April, 1865: The 23rd North Carolina State Troops, under the command of Captain A D Peace, surrendered at Appomattox Courthouse, Appomattox County, Virginia, on 9 April, 1865. North Carolina State Troops, 8 May, 1861: Ten regiments of North Carolina State Troops, numbering 1st to 10th, were organised to serve during the war on 8 May, 1861, and thirteen regiments of volunteers for twelve months service were authorised, numbering 1st to 8th and 10th to 14th on 10 May, 1861. Special Orders No.222, Adjutant and Inspector General's Office, Richmond, Henrico County, Virginia, 14 November, 1861, authorised the original ten regiments of state troops to keep their numbering and the volunteers to be redesignated and all units were subsequently known as North Carolina State Troops. The 13th North Carolina Infantry was assigned to the Sixth Brigade, First Corps, Army of the Potomac, under the command of Colonel J A Early, by Special Orders No.169, Paragraph I, Headquarters, First Corps, Army of the Potomac, Camp Pickens, Manassas Junction, Prince William County, Virginia, on 25 July, 1861.